Optics is everything in contemporary politics and the Federal Opposition Leader Bill Shorten understands its power. Shorten takes media advice from among others Dee Madigan of Campaign Edge and Eammon Fitzpatrick of Hawker Britten. 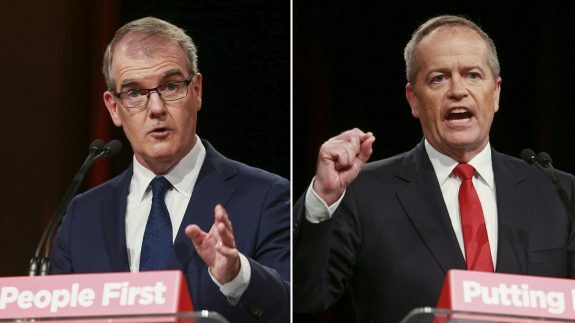 Thus, Bill Shorten’s welcoming of Michael Daley MP at the launch of the NSW ALP election campaign at the Revesby Workers Club on Sunday March 10, bristled with the nomenclature of ‘optics’. And while various news outlets faithfully reported snippets of the event, the proceedings were streamed via the internet on Facebook and other digital platforms. Both Madigan and Fitzpatrick are inheritors of the digital age. And winning the votes of those who prefer streaming to free-to-air TV or reading old fashioned ‘inkies,’ could tip the election in Daley’s favour. Now contrast the Liberal Party launch on the same day with a mute PM Scott Morrison and the Usual Suspects of John Howard et al, dutifully covered by the biggest inky of them all, The Australian no less. In the optics stakes the winners were undoubtedly Bill Shorten and Michael Daley. Perhaps the worst example of bad optics is this photograph of the wife and daughter of Ryde ALP candidate Jerome Laxale being mobbed by blue clad Liberal supporters. So let’s consider what is at stake in Ryde / Bennelong as well as the big Labor seats west of the Sydney CBD. While many of these enclaves remained loyal to the ALP in the Rudd Gillard Rudd years, and stayed faithful to Bill Shorten, their NSW State equivalents, deserted the party in the two previous elections. Indeed, seats such as Penrith, Revesby, Riverwood and further west Bathurst, must return to the State Labor fold. For it is in western Sydney and its environs NSW will witness the biggest of big infrastructure projects; the construction of the Nancy Bird Walton Airport at Badgery’s Creek. This is nation building stuff and its impact will be felt for at least a century. Policy wonks and political hard heads are hoping its construction and management is overseen by a sensitive state and Federal government, and not monstered by a Liberal apparatchik such as Max Moore-Wilton, famously given the shortest of short shrift by Anthony Albanese MP. Labor members in adjacent Blue Mountains seats and local government areas are terrified of an airport built by a Liberal clique currently supervising the Westconnex debacle. Say what you like about NSW Labor, but it delivered the State, Australia and the world, the best Olympic Games of the age. Michael Daley knows this and has a Cabinet-level understanding of how enormous projects can be delivered on time, on budget. It is this reason I contend, why he stood up to Alan Jones. Bill Shorten is familiar with Daley’s Labor pedigree and appreciates the fundamental fact that it is easier to deal with a NSW Labor premier, than a lame duck Liberal premier, whose political future lies in the maw of Alan Jones. The alternative is a minority Labor State government which may rely on the two Greens State members Jamie Parker (Balmain) and Jenny Leong (Newtown) for Confidence and Supply. Add to this mix Mark Latham as a One Nation MLC and we have a recipe for a debacle. Given the fact thousands of citizens in western Sydney are about to learn the joys of changing trains in Chatswood to get to the CBD, or losing bus services in and around the Ryde electorate, (see above) March 23 2019 will be one of the most important dates on both the NSW and national electoral calendar. I’m sure Greens State members Jamie Parker and Jenny Leong would improve a NSW Labor government if they held the balance of power. Nevertheless the people of NSW deserve a better government than the awful conservatives and a decisive Labor win would be great and even better if a few more Greens representatives are elected as well. Great to have an article WITHOUT a pic of Morriscum at the top. Thanks Henry. I hope it’s a Campbell Newman style beating in 2015 where the polls were 50/50 and Labor went from 7 to 44 seats. Although in this instance, I hope Labor wins in their own right with a majority Govt. I am not a fan of hung Parliaments at all, regardless of who the major party is. A hung parliament on the right only endorses the right most IND are Libs anyway. A hung parliament on the left only hinders the left. We have enough history on that with Gillard and the Greens and we are still paying for it. And where it’s left and right wing minors like Katter in QLD it’s eye rolling and very frustrating. Hung parliaments are a ridiculous amount of demands and power at the hands of one or a few and then what the majority voted for is denied and a radical voice can be elevated as more important than what it should be like Katter in QLD. Now it’s not a hung parliament, we don’t hear Katters and their demands and holding everyone to ransom. I also hope One Nation gets ZERO seats. Their latest policy testing Aboriginal people’s DNA is abhorrent. Interesting points Henry. I wondered how the internal fighting in the Greens will play out. Well, Trish and Helvi’….it’s refreshing to read some comments where, unlike several other topics recently under discussion on the site where vitriol, vicious accusation and threats and attacks seem to be the norm!…And who would have expected THAT after such aconcerted effort to “rid the site” of “abuse and umwarranted confrontation”…and would you conceive it! !..now most of the abuse comes from those same few of a cabal of “peace-lovers” and “everybody has a right to make an opinion” rent a crowd!…..who’d a thunk it!! I think Gillard did an amazing job with a hung parliament – a testament to her own negotiation skills as well as Labor’s superior policies. She was more reliant on Oakeshott and Windsor than the Greens in the HoR at least. I agree the NSW Greens have lost the plot at the moment. But the idea of Latham being any part of a balance of power in the NSW upper house is too disturbing to even contemplate. Antony Green seems to think he will be elected. I too miss Gillard, Brown, Oakeshott and Windsor combination , that’s how it should be done; I’m sick of this two-party bickering…. Kaye. Latham will be elected and yes his presence in the upper house will be a worry, but that Chamber is not as significant as it is given credit for. helvityni One need only look to Tasmania where State Labor refused an alliance with the Greens after the last very close election. Political pundits with a similar view to yours, often suggest a kiss and make up scenario. The problem is it is almost impossible to know with whom a negotiation might take place within the Greens party infrastructure. This is only true of NSW. I’m sure its apparatus elsewhere is much better. Whilst Latham may not wield much actual power, it will give him a public platform. He has been sacked from so many media gigs when he has crossed the line with his craziness, but we can’t sack him from parliament. Will the media ignore his ravings? Will he be so bizarre that shining a light on him will make even One Nation voters cringe? Will he become a magnet for the crazy fringe? We can do without any more madness in politics. Kaye. Agree wholeheartedly. And his profile will increase thanks to the likes of the Murdoch apparatus. But it is the make-up of the ‘bear pit’ which will tell the tale for NSW over the next four years. The role of Speaker for instance, will be pivotal and might be an Independent. Thuggo Latham has about as much credibility as Scummo has moral fortitude. I wonder how long Latham’s honeymoon with One Nation will last before he follows their tradition in breaking away? Perpetual outrage will only get you so far because eventually you have to find solutions and there’s not much a lone whining voice can really do, especially as a non-policy making MLC. Unless there’s a hung Parliament or minority Government he’ll be just another powerless magnet for the disaffected or those rage-addicted reactionary One Nation protest voters. Hm, a hung parliament swinging in the breezes outside parliament house. Sounds good to me. Yeah, you go for it St Baker of the Greed, we can’t have the silly bloody unproven climate change and global warming getting in the way of your profits can we? How dare some bureaucrat tell us what is obviously a lie! You should go and whine to you and your corporate mates puppet party about it.